A good old fashioned letter will always have a special charm that cannot be duplicated. Unfortunately, it’s so much easier to open your inbox and compose a message the modern way. Ivan Cash started a project that keeps the art of letter writing alive…at least for a few weeks. 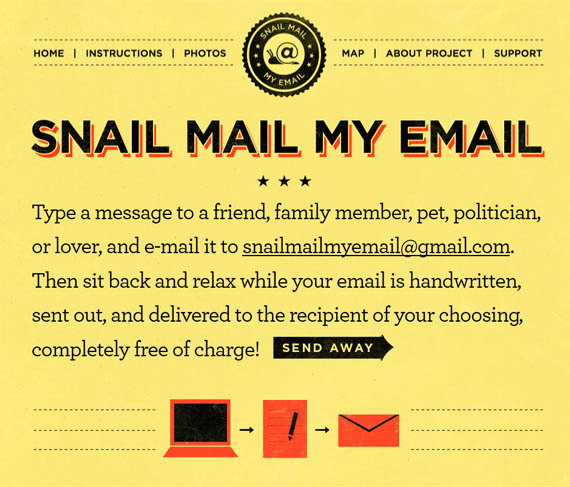 Save yourself the trouble of finding attractive stationery, the right pen and a stamp because Snail Mail My Email is a month long, interactive art project transforming people’s emails to handwritten letters that are physically mailed, completely free of charge. Your personal ghost writer will even add a little piece of artwork to your correspondence.